The helicopter equivalent of “if you build it, they will come” has got to be “if you provide the funding, they will acquire.” None of the “need” for helicopters that fueled year-over-year growth before the global economic slowdown in 2008 has gone away—simply the money to acquire them. Dublin, Ireland-based Milestone Aviation Group is offering one possible solution for operators. Started in August 2010 with $500 million in equity seed capital raised through a group of investors led by co-founder and Chairman Richard Santulli, the company has expanded rapidly with the recent finalization of a fleet purchase for 19 additional Sikorsky S-92s and the closing of a series of debt facilities totaling $400 million, including a $265-million debt facility from Deutsche Bank. I had the opportunity to interview Santulli—who founded fixed-wing fractional ownership provider NetJets in the mid-1980s (and served as Chairman and CEO until August 2009) after getting his start in the helicopter leasing business—about the evolution of rotorcraft financing. Rotor & Wing: What will the debt facilities allow Milestone to do? Santulli: The good news is it proves that we can get debt. I laugh, but the market was looking at us saying, “you’re a very young company,” which obviously we were. A lot of the banks looked at us like a commercial airplane lessor, and we kept telling them that if you’re looking at us that way, you’re going down the wrong road. The reality was not too many financial analysts are actually that knowledgeable about helicopters. The fact that we were a young start-up, and add to that there weren’t a lot of helicopter-specific financiers, it made it very difficult to do. R&W: What is Milestone’s outlook? Santulli: We’ll just keep growing. When we first started doing debt deals, we had a bunch of letters of intent. With the whole European crisis, it made it tough to get a debt deal done. But that’s changed now, and we’re very comfortable with our position in the market. Today we have a very large standing. R&W: Why the S-92? Santulli: We bought the EC225 also. When we were looking at the marketplace, we realized that more and more is being done farther offshore. You look at oil production around the world and it’s father offshore, so you need helicopters with more range that can carry more people, like the S-92 and EC225. We look at the S-92 as obviously a huge factor in the oil and gas market, but we also look at it as a very successful SAR machine. So it’s the combination of search and rescue, and primarily oil and gas, that we love that helicopter. If you look at the supply of heavies, and the supply rates, and you look at where they’re going to be against the demand—especially if you assume the retirement of helicopters that are 25 years or older—the disparity between supply and demand is just very, very large. R&W: What other helicopters types is Milestone interested in? Santulli: We’re talking to everybody. Eurocopter with the EC175 and AgustaWestland about the AW189. We’re waiting for the [Sikorsky S-76] D model to be certified as well. R&W: What’s the response been from operators? Santulli: It’s been terrific. You know, I did this back in 1980, and really the interesting thing is, most of the operators don’t want to lease. That was true back in the ‘80s and it’s true now—most operators would prefer to own the asset. Any time there’s a new tender out there—not just the renewal of a contract—that means an operator has to acquire a new piece of equipment. And a lot of operators don’t have the balance sheet, especially with the heavies, to actually debt finance, or put up 20 to 25 percent to do the debt financing. So we’ve convinced a lot of the operators by saying, “Listen, we’ll provide 100 percent of the financing, it’s true you’re not going to own the asset but we’re going to give you a fixed rent and if you can make money on the contract, then bid it.” If you can’t, you shouldn’t bid a contract anyway, whether you own it or not. R&W: What role does the global economy play in an operator’s decision to lease vs. buy? Santulli: Well, first off, the banking market has been dramatically reduced, there are not as many banks willing to provide debt financing. Secondly, I just think that it’s the fact that the operators now realize that the equipment costs so much more than it did 10 years ago because they’re drilling so far offshore. And in order to compete they need access to the capital, from any source they can get it. All the operators we do business with, they do debt financing as well, but the question is, what’s the appropriate balance? 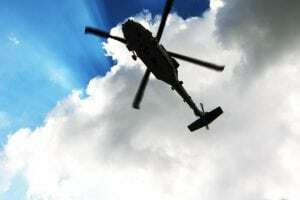 There is an appropriate balance—they should own some helicopters, and if they want to grow their business, unless they have big balance sheets, they’re going to have to lease. There’s no question about it. Rotorcraft Report: Heard in the Hallways: Is the USAF In the Fight?